Wacky may not be a fitting word to use to describe the focus of today's blog. Cosmetics have been a part of human culture for thousands of years. There were many varieties of make-up available for both men and women during the ages of the Ancients: Egyptians, Greeks, and Romans. Only through trial and error would they discover how effective the make-up was at enhancing beauty, when people tried it on their own skin. That was fine, unless poisons were incorporated such as lead. The idea of trying new looks out on inanimate objects was introduced some time after the mid-1800s, when the French developed mannequins. Originally made out of papier mache to showcase new fashions, they became extremely lifelike and, eventually, were soon embraced by cosmetologists as accommodating subjects upon which they could perfect their art. 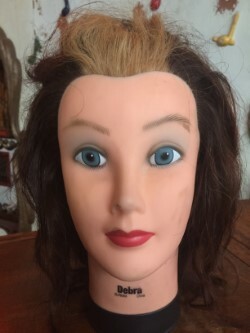 The American Treasure Tour has a number of Debra Cosmetology Mannequin Heads on display. Their exteriors are made out of rubber, and their interiors are polyurethane. They have real human hair, and are created by Celebrity specifically for amateur and professional cosmetologists to use. The heads can be used for both hair styling and cosmetic application – many cosmetologists use them for their y could apply any sort of make-up and, if they made a mess of things, they could clean them up and easily re-apply. Of course, the plastic needed for that technology would not be introduced until after World War II. So, come to the tour and check out our disembodied cosmetology heads. But please do not attempt to apply make-up to them. Or to any of our guides. They prefer to apply their own make-up.